Are you sick of getting pushed around? Try the garb of a sumo wrestler on for size. It's not as easy as it looks. The wrestlers don't just binge on cocoa puffs for a year before they enter the ring. Their wrestling life starts when they're teenagers. Before they step into the professional arena, sumo contestants live in a dorm, eat what they're told to, wear what they're told, and do what they're told. 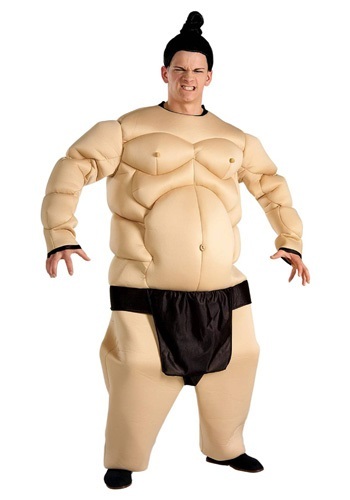 True to the reality of most sumo wrestlers, this sumo costume is bulky but well-muscled. A sumo wrestler isn't going to win if he doesn't have a beef to back up that dough. While you could go through years of training, we have a much easier way to become a sumo wrestler this year. there are just a few things you need to practice before entering the ring. You need to conquer gracefully balancing your bulk on the heels of your feet as you sit on your tippy toes. Or try the art of stomping your feet, this can be more important than actually wrestling. In Sumo tournaments, the ceremonies between the wrestling matches can take more time than the actual grapples. The ceremonies include impressive foot stomping, singing, and salt throwing. Since this sport has been around for 1,500 years it has picked up plenty of traditions. Now that you're a sumo wrestler, you could even take part in the Nakizumo festival, a 400-year-old annual festival where sumo wrestlers try to make babies cry to ward off evil spirits. You might put on a sumo costume to try your hand in the ring. Maybe you're looking for an excuse to eat endless sushi this Halloween. Maybe you want a legitimate reason to scare your baby niece until she cries. Whatever the reason, you'll have a great time throwing your weight around this Halloween.